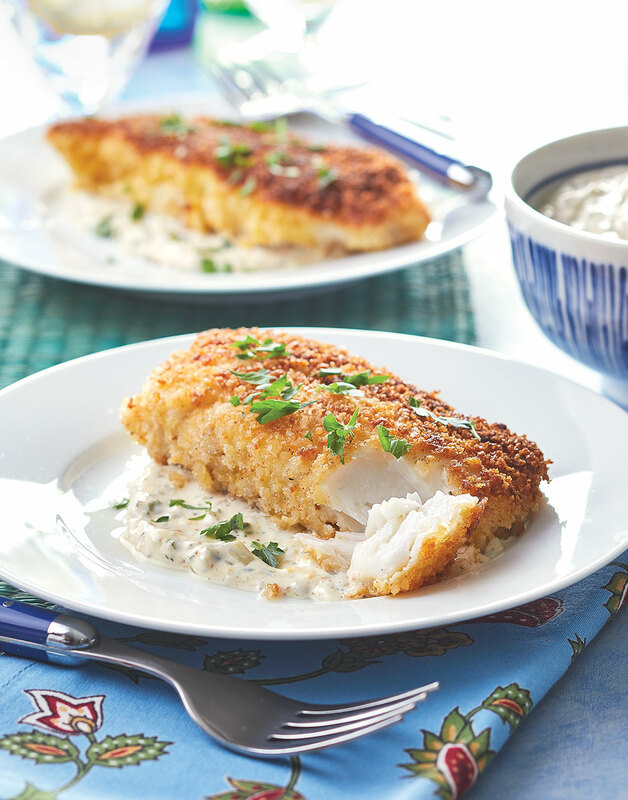 Thick, tender cod fillets, a crispy, crunchy panko coating, and a from-scratch tangy tartar sauce take the mundane to simply marvelous in just about half an hour. Looking for more fish recipes? Check out some other favorites! Combine mayonnaise, pickles, capers, parsley, zest, lemon juice, 1 tsp. Dijon, black pepper, salt, and 1/8 tsp. cayenne for the tartar sauce. Place flour and panko in two separate shallow dishes. Whisk together eggs, 1 Tbsp. Dijon, and 1/4 tsp. cayenne in a third shallow dish. Dredge each fillet in flour, dip into egg mixture, then dredge in panko. Heat enough oil to cover the bottom of an ovenproof skillet over medium-high. Add fillets; fry until deep golden brown, 5–6 minutes. Gently flip fillets; transfer skillet to oven. Bake fillets until a thermometer inserted into centers registers 145°, 4–6 minutes; transfer to a paper-towel-lined plate. Serve fillets with tartar sauce. For extra-crispy fish, and maximum coverage, dredge the fillets in the flour, egg, and panko two times.